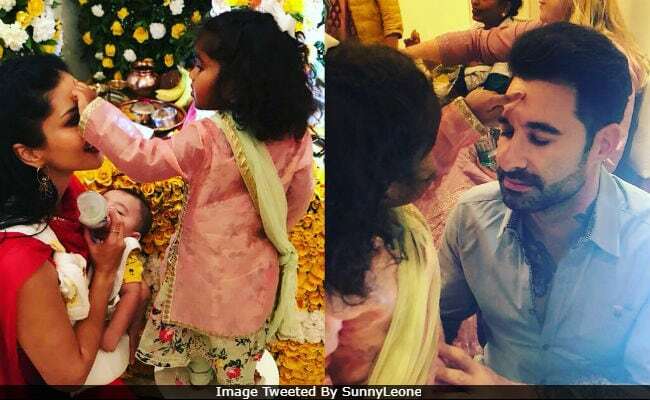 With their three children and a new home, this year's Ganesh Chaturthi is indeed special for actress Sunny Leone and her husband Daniel Weber. Sunny Leone is constantly filling up her Ganesh Chaturthi album with some of her favourite pictures and one such post arrived this evening, which is an adorable collage of the actress, Daniel and their daughter Nisha. In the picture, Nisha is seen putting teeka on her parents' foreheads and is dressed cutely in a salwar suit. "She is the reason I believe in God. To be blessed by her is like having the hand of God on our heads! Nisha Kaur Weber, our gift from heaven," Sunny Leone captioned her post while Daniel, who also shared the same picture later, wrote, "My sweet angel from God, Nisha Kaur." We also caught a glimpse of one of their twin sons in the post. Here's Sunny Leone's post for daughter Nisha. (We're not crying, you're crying). 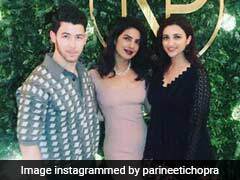 The picture appears to be taken on Thursday evening, when the family celebrated Ganesh Chaturthi were with the producers of her web series Karenjit Kaur: The Untold Story Of Sunny Leone. "Thank you for inviting us to our very first family darshan. Wanted to go to so many events but the Webers are 7 and it was a school night. So happy I could share this special evening with the kids and you all!" Sunny Leone wrote. In the morning, she posted about moving into their new home in Mumbai. Sunny Leone and Daniel Weber adopted Nisha from an orphanage in Latur in July 2017. Noah and Asher, their twin boys, were born via surrogacy in March this year.